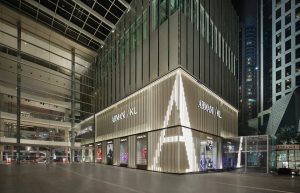 Giorgio Armani has announced the opening of Armani/KL’s newly renovated space in Pavilion KL, boasting over 600 sqm of the brand’s distinct cool. Designed by Mr Armani himself in collaboration with a team of architects, the boutique is fronted by an impressive façade of bronze metal vertical louvers, a beacon of natural light and a magnificent window to sartorial treasures within. 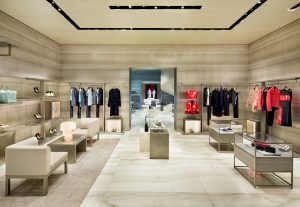 Platinum-finished doors swing open to the Giorgio Armani boutique, revealing rooms of various characters, each with a different floor of fine marble and precious onyx. Wall coverings of gold, silver, green and aqua enhance the colour scheme, while wooden furnishings with silver and chrome ribbing highlight the wallpaper, armchairs, carpets and lamps from the Armani Casa collection. 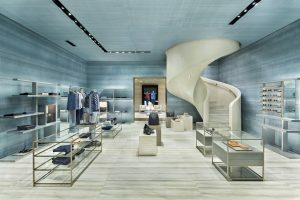 Then there’s the Emporio Armani store, with a natural sense of movement in its curved walls. Here, the floor is finished with marble and the ceiling painted with a glossy marmorino effect, the grey fabric walls adorned with a black crystal finish. Accessories beckon from behind crystal glass, the backlights of which glimmer amid the men’s, women’s and EA7 sports collections. 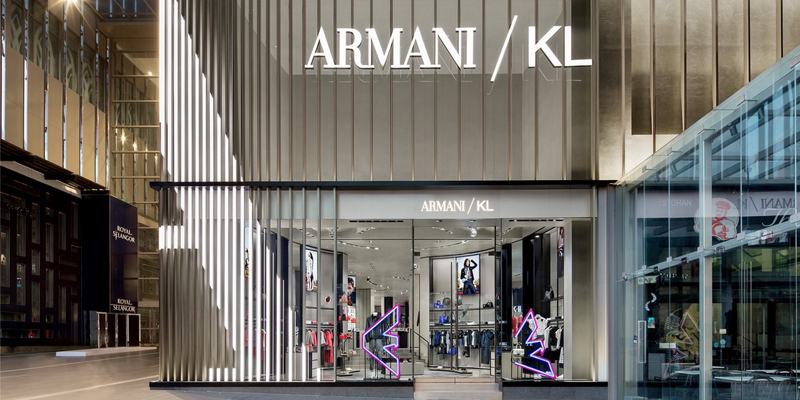 Don’t miss the Armani Exchange store on Level 4. Featuring the new concept for the relaunch of A|X, inspired by the aesthetics of a contemporary industrial hangar, material connotations here are strong. Think raw steel, aged wood and concrete, coming together to evoke the industrial interior of a dynamic New York.